Over the years, the Firefly Arts Collective, (FAC), has been proud to provide grant support to Firefly artists to enable them to express and fulfill their varied creative visions. These grants are intended to support and promote radically-expressive, community-based, interactive and/or collaborative projects that help define and shape the creative core of the event. Art is a central part of Firefly, and the event wouldn’t be the same without the wonderful pieces that have been brought to Vermont over the years. Bringing art is a great way to add a piece of yourself to the event and contribute/participate in a meaningful way. Art grants are intended to support and promote radically-expressive, community-based, interactive and/or collaborative projects that help define and shape the creative core of the event. This year, there are nine types of grants. Please click on the links for more details about each grant. Creativity Grants: basic grants awarded in $150, $300, $599, $1000, $1500, and $2000 tiers, for projects coming to Firefly Arts Festival. The previous Anniversary Grant levels have been rolled into Creativity Grants to make things simpler! 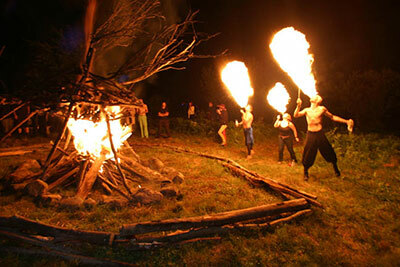 Temple Grant: a singular $2,000 grant to build the Temple at Firefly Arts Festival. Legacy Grants: small ($100 or $300) grants to assist returning projects to Firefly. Burner Exchange Grants: Mid-range grants (up to $1,000) to help transport art from other burns to Firefly. Skillshare Grants: Mid-range grants to help Firefly participants acquire new skills to produce their art. Moonshot Grant: First piloted in 2018, this grant may be awarded for a supersized project, awarded from $2000-$5000. Smol Grants: These grants are awarded on a rolling basis after the awards for other grants, in amounts between $40 and $99, for artists working on small-scale projects. FIGMENT Bonus Grant: A $100 bonus given to projects funded by one of the other grant types (excluding Smol) that also make an appearance at FIGMENT Boston. More details TBA! We are looking for cool stuff, inspiring stuff, stuff that makes you go “Wow! why didn’t I think of that?” Defining that is, of course, different for every individual, but let us try to explain what that means. We are looking for is to be surprised, intrigued, curious as to how your piece works. We want to feel compelled to play with it, to see what it does, to appreciate what it has to say or show us, to appreciate how it fits into the environment or creates a space for us to enter and feel special. We want all that and more. We want you to show us what you got up in that old cranial vortex on your shoulders that you would like to make real and share with others. Although we will support as many projects as possible, please keep in mind that the Firefly Art Grant budget is limited. This money comes from the community via ticket sale proceeds and private donations. All submitted requests, large and small, will be carefully considered and partial grants are likely to be disbursed. Please do not include transportation costs (to and from Firefly) as part of your budget. As long as you can get to a few common “Art Hubs” in the Camberville/Boston area, FAC will be arranging for free transportation for your art. Your budget can include anything you need to make the project happen (e.g. : art-specific, materials, fuel, etc.). Time and effort is how we all participate and contribute to the Firefly Community, so please don’t include labor costs or wages in your budget. We do not fund general-purpose durable goods like DJ / VJ gear or a generator, and we won’t fund your tickets, your food or camping gear, or pay for your labor. This is intended to be a quick reference guide. Please see the full information for each grant for all the details! Make sure to read all the requirements for the grant you want to apply for, and then sign up at the Art Grant Portal! Feel free to reach out to us at grants@fireflyartscollective.org if you have any questions!